Germany has thrown its weight behind the idea of the creation of a pan-European army, scaring British Euroskeptics and raising suspicions of Berlin’s ambitions to untie its foreign policy from NATO. While Moscow experts see few chances of the idea bearing fruit, they believe that the existence of a purely European defense union would be in Russia’s interests. A defense paper being produced by German strategists revives the concept of the establishment of a structured European army, with joint headquarters staffed by civil executives and military officials plus a council of defense ministers, enhanced co-ordination of production of arms and armaments, and shared military assets. The German document refers to EU missions carried out in recent years in Chad and the Central African Republic as well as the antipiracy Operation Atalanta, aimed at preventing “robbery on the high seas” off the Somali coast. These examples of successful projection of the military potential by the community of European nations are used to support the German suggestion that from now on the focus should be tilted toward the EU’s “eastern and southern neighborhoods,” thus echoing the NATO doctrine that the main security threats are being generated by a resurgent Russia and the restive failed states of the Middle East and North Africa. In fact, the concept of a European army is nothing new. It crops up regularly. In March 2015, the European Commission President Jean-Claude Juncker called for putting together a multi-national armed contingent to address the specific defense and security needs of the Old Continent. Whether this will allay possible fears in Washington of Europe hoping to steal away from under its security umbrella is another question. Anyway, the German paper is for now just one of the blueprints to be considered in the preparation of EU foreign and security strategy scheduled for review by the European Council in late June. There is a strong premonition shared by the UK’s the “Brexiters” – those in Britain in favour of leaving the EU – that the union is slowly inching toward a super state with Germany as the supreme decision-maker. Another ex-official of the highest ranking, former British Foreign Secretary Lord Owen, cautioned that full implementation of the European defense strategy would alienate the United States, which is currently the main security provider for the EU. By proclaiming a pivot to Asia and the Pacific, the U.S. has caused anxieties that it was abandoning its previous Europe-centered military strategy, with the prospect of diminishing its commitment to assuaging local security concerns. A high-profile role for Germany in the establishment of a European army raises certain questions, with the presence of German soldiers in a proposed EU army alone enough to be unpalatable to many Europeans, for whom Germany’s Nazi past is still far too close for comfort. “There are still many places, not least around the EU, where German troops under any flag would not be acceptable,” noted Patrick Smyth in an article in The Irish Times. Roderich Kiesewetter, foreign affairs representative of Christian Democratic Union and Christian Social Union parliamentary group in the German Bundestag, has made the surprising claim that Washington might have fine-tuned its approach to Europe, saying it would be foolish to deny that realities on the ground are changing. And yet, suspicions that some parts of the German political elites have found the moment opportune to bring back to life the Western European Union out of self-interest are abundant. The Western European Union (WEU) was a defensive alliance composed of 10 EU member states: Belgium, France, Germany, Greece, Italy, Luxembourg, the Netherlands, Portugal, Spain, and the United Kingdom. The primary purpose of the grouping, which bore a striking similarity to NATO, was to offer mutual military assistance in case of external aggression. It was set up in 1948 and became defunct in 2011. Actually, the WEU was a vague structure with little leverage, and as such was not regarded by the U.S.-led NATO as either an asset or a liability. Its departure into oblivion went almost unnoticed. However, it serves as a formal precedent of a Europe-centered defense entity with no “extra-regional” outside management. Today, when Germany has the indisputable clout of the decision-maker-in-chief and ultimate power broker in the EU, a new/old military alliance would inevitably be subordinate to the will of Berlin and not of Brussels. At face value, the WEU-2 or NATO-2 or whatever it is labeled at the end of the day would not compete with NATO. But this peaceful co-existence might not last long. Kirill Koktysh, an associate professor at the Moscow State Institute of International Relations, voiced this opinion talking to RBTH. – Can we detect any hidden agenda in this move by the Germans? “The NATO membership card does not come for free. Each participant is obliged to spend 2 percent of GDP for defense purposes. 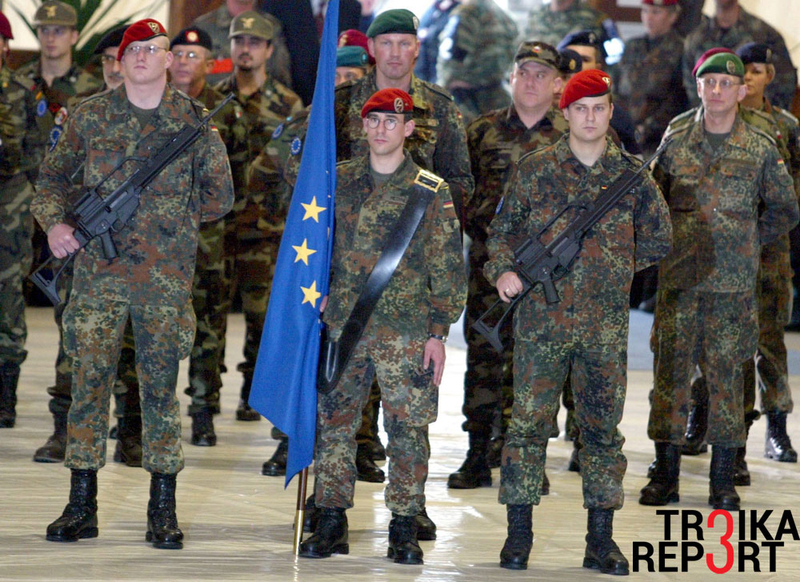 Should Germany become part of the European defense union (EDU), it would allow the government in Berlin to allocate money previously spent within the NATO budget guidelines on the build-up of the European army. – Do you mean to say that the German military-industrial complex might have had a say in shaping the white paper? In his turn, Ivan Konovalov, director of the Moscow-based Center for Strategic Trend Studies, provided a more robust forecast for RBTH. At least for the moment, he dismisses the initiative as stillborn but believes that Germany will achieve its strategic goal, although later rather than sooner. “It is no wonder that Germany has a stake in shaking off its standing as the ‘defeated’ nation in World War II. But for now, it will fail to set up a functional pact. As a military man, I can tell that the key element in such a structure is the system of command. “In NATO there is hardly any doubt who calls the shots and takes the final decision. It is the United States. In the new alliance it would take time for Germany to acquire the supreme authority so as to rule out tensions in the decision-making process with, say, the French or the Poles. – So if I understand it right, the “Made in Europe” NATO-2, as they say in Texas, is simply “all hat, no cattle”? War with Russia on the horizon? British general Sir Alexander Richard Shirreff, who was Deputy Supreme Allied Commander Europe from 2011 to 2014, has claimed in his recently published book 2017 War with Russia that Europe is on the verge of war with Russia and that Latvia would be the first of the Baltic countries to be occupied by Moscow. The general gives a precise forecast: The invasion will take place in May 2017. The ex-commander went as far as to predict that after swallowing the Baltic states, Russian President Vladimir Putin would then threaten a nuclear strike if NATO gets ready to retaliate. As The Guardian reported, journalists at the book launch reacted “with scepticism” to the general’s predictions. After all, an “ex” is an “ex,” and a retired general is often fighting either a lost war or a future war he was never part of. For now, it makes sense to keep the powder dry. But should the scenario of pro-European armed forces evolve into reality with time, Moscow would most probably benefit, according to Kirill Koktysh. Why so? It would be easier and more productive to engage with Berlin if it pursues a Germany-centered independent foreign policy in tune with its core national interests. Basically, the more European is the European defense union, the better for the relationship between the EU and Russia.